In the season’s first month, the San Jose Sharks have done a tremendous amount of personnel blending among the skaters. There are plenty of questions and criticisms of head coach Peter’s DeBoer’s approach. Whether these criticisms are valid largely depends on where things go from here. This early in the season, there is merit to exploring the roster. DeBoer’s frequent use of the ‘line blender’ (mixing player combinations on forward lines and defensive pairings) might seem puzzling, but now is the best time to find combinations for the long haul. Or for that matter, find combinations which will work when circumstances such as injuries, suspension and trades enter the picture. Having players gain on-ice familiarity with each other is beneficial. Performing roster experiments early in the season gives the coaches better insight into which adjustments will work when circumstances later on dictate changes. Before delving into DeBoer’s handling of the roster, I’ll mention the benefits of blending players. Two benefits are mentioned above, both are long-term benefits: give players greater familiarity with each other and exploring the way player combinations work with each other. A third benefit is game-specific; to find combinations which work against that specific opponent, that night. It is often done to change the dynamics within a game for a team which isn’t performing as well as expected. A fourth benefit is to give a player a promotion for their strong play in a specific game. The converse happens, too — someone who isn’t having a good game gets an in-game demotion. This reward system tends to push players to better performances. In the usual vernacular, the term ‘blender’ applies to mixing up personnel on forward lines. But DeBoer has used his blender extensively on the defensive group, too. Five defenders have played in all 17 games, the sixth has played in 16. It looks stable, based on games played, but DeBoer has mixed things up considerably within the group; pairings have been anything but stable. 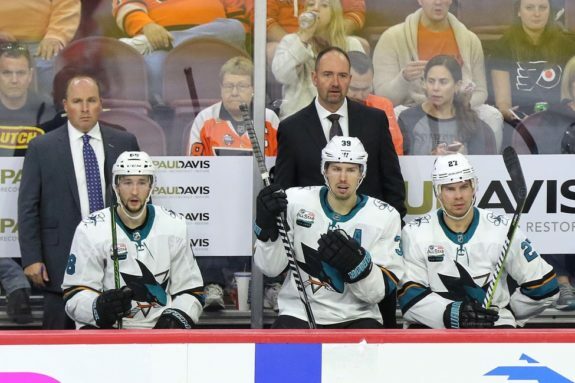 For DeBoer and the Sharks, there is one huge and complicating factor. Erik Karlsson needs to be re-signed and getting him to that point is a major consideration. Thus far, Karlsson has not produced ‘as expected’ and growing pains are evident. Prior to the season, I felt Brenden Dillon might be the best partner for Karlsson, at least from the team perspective. 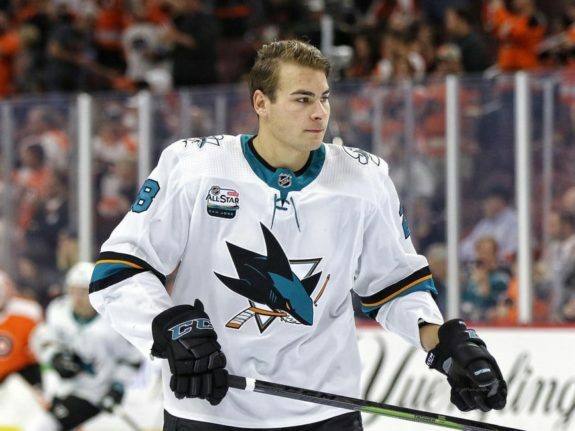 But Karlsson might hesitate to re-sign with San Jose if he saw Dillon as his long-term partner instead of the very talented Marc-Edouard Vlasic. Indeed, Vlasic was the primary partner for Karlsson out of the gate, but the pairing hasn’t been the best in hockey –a reasonable expectation given the enormity of the talent. DeBoer has since partnered Dillon and Karlsson more often. But this is just the surface of the pair blending. DeBoer obviously does not trust Joakim Ryan, and he seems to be about the only one who doesn’t. Ryan is Brent Burns nominal partner, but Ryan often disappears onto DeBoer’s bench for the third period and is typically given restricted shifts earlier in the game. His ice time has been below 10 minutes in four of the last five games he played. Ryan was benched for the Sharks most recent game against the St. Louis Blues, which the Sharks lost, 4-0. Burns needs a defensive partner who works well with him. Juggling partners for Burns is akin to coaching malpractice. His best seasons on defense came with the savvy and steady Paul Martin as his partner. Switching to other partners has usually been unhelpful to both Burns and the partner. In some cases, it’s been less than the sum of its parts (Vlasic) and in other cases, it’s been positively toxic (Dillon). 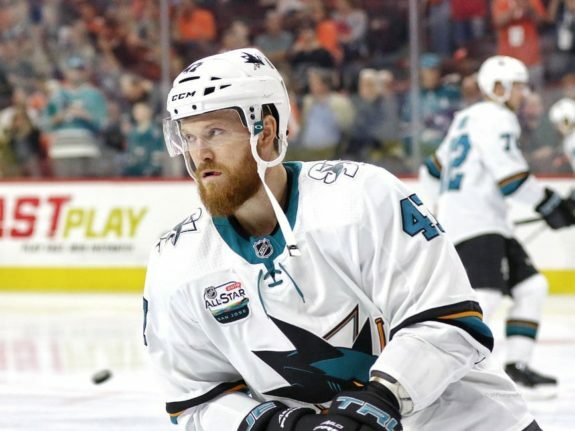 Ryan is the lone Sharks defenseman proven capable of filling the role Paul Martin played. Last season, Ryan played most of his minutes opposite Burns and finished plus-13, best on the team. Burns, who played much more than Ryan and therefore plenty of minutes with other partners, finished minus-16, worst on the team. The difference points to Ryan’s importance to Burns, and the risks which come with Burns playing with partners who are not a good fit. Burns has finished as a minus player in seven of his last nine seasons as a defenseman, so getting Burns to a ‘plus’ rating is an accomplishment. Burns and Ryan are both plus-3, tied for the best among Sharks defensemen (along with Justin Braun). The plus sign for Burns comes from his time paired with Ryan. However, Burns is skating roughly seven minutes a night (at 5-on-5) away from Ryan. It’s tough to discern how this benefits the team. Many of these minutes see Burns paired with Braun. Braun, like Burns is a right-hand shot. Braun has been game in this role while playing his ‘off’ side, but it is clear he’s not being used wisely. He’s at his best complimenting Vlasic for 20 minutes a night. Burns has also been paired with Karlsson, Vlasic and Dillon – which is literally everyone else. This is not a formula for success. Given Burns importance to the team (he is the highest paid player in the team), getting him optimized matters a lot. At his best, Burns is as valuable as any player in the league. DeBoer’s actions, should he continue his current path, will take a toll on the defensive roster. Both Karlsson and Burns should see fewer minutes (over 25 and 24 minutes respectively). If all goes right, the Sharks will play over 100 games this season and lowering the playing time of their elite defensemen now can have benefits later on. In recent seasons, both players have had health issues which effected them late in the season (or in the playoffs). Ryan and Dillon can handle considerably more ice time, without being a liability to the team. Ryan is down over five minutes a game from last season, Dillon is down two. The consequences stretch beyond this season. I expect both Dillon (a free agent in 2020) and Ryan (a restricted free agent at the end of this season) want more opportunity than DeBoer is offering. Both merit more than DeBoer is offering. It’s even worse for seventh defenseman Heed. He is an unrestricted free agent after this season. It is easy to imagine all three players wanting out of San Jose, perhaps sooner rather than later. Their careers are all taking a significant hit under DeBoer. It’s not like the Sharks have a strong defensive pipeline, either. Top prospect Ryan Merkley is work in progress and is really the lone defenseman within the Sharks system whose talent equates to an NHL career. The Sharks have exceptional talent in their defensive group, but managing it for the both the present and the long term is a challenge. Of the seven roster defensemen, three likely aren’t happy with their role and a fourth, Karlsson, isn’t close to meeting expectations. It doesn’t seem like DeBoer is managing for the longer term — DeBoer isn’t meeting the challenge. As I’ve written before, the Sharks are a power forward team and this identity is getting clearer by the day. Power forward Timo Meier leads the team in goals. Add in Tomas Hertl and Evander Kane, and you’ve got over 40% of the team’s goal scoring. The best line has included Logan Couture, the team’s best player, centering Hertl and Meier (though some are reluctant to call it the team’s top line). 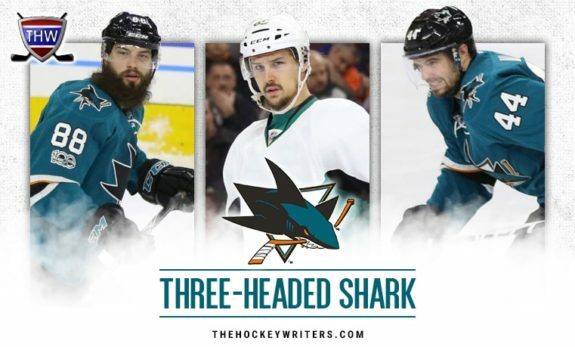 While it may seem ideal for this trio to stay together, I understand DeBoer’s desire to have a power forward on three different lines (with Barclay Goodrow, another albeit far less talented power forward, on the fourth line). Mismatches are critical and having three lines to defend, each with a power forward, is more challenging for opponents than having to defend one line loaded with power players. DeBoer has a conundrum. He can break up his best line (Hertl, Meier, Couture) and increase his forward depth. Or he can roll his best line and hope other, less talented lines, meet the challenge. If this were the only issue he toyed with, I’d understand. But it doesn’t appear this way. DeBoer’s line juggling seems excessive given the roster continuity. The Sharks have 10 forwards who have played at least three seasons for the Sharks. Evander Kane joined the Sharks at the trade deadline last season is the eleventh forward, leaving only one playing spot if everyone is healthy. The other forwards who have played are Gambrell (who played three games last season with the Sharks), Chartier who has been with the Sharks AHL affiliate and Finnish import Antti Suomela. Of the three, only Suomela has carved out an every day role. While DeBoer can hunt for better chemistry among his forwards, his forwards are not new to each other. They don’t need a lot of blending to figure out how to play with each other. Against the Minnesota Wild, DeBoer seemed to come to a conclusion which is critical to all other decisions. Joe Thornton, legend that he is, no longer belongs on the nominal ‘top line’ with Joe Pavelski and another top winger. Thornton has been seeing more time with players like Marcus Sorensen and Goodrow, and it is working. Against the Wild, one of the league’s best teams in the young season, Thornton played a third line center role and finished plus-3, his best total since before either knee injury. Alas, before the midpoint of the next game against the Dallas Stars, Thornton was again on a line with Pavelski. Finding the right role for Thornton enables sensible line choices. 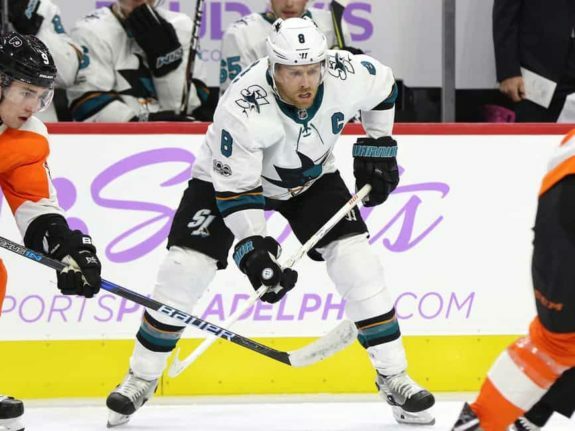 It frees Joe Pavelski up for a role as center, where his hockey savvy and skills are more useful. It gives DeBoer the chance to roll four lines, which is ideal for a power-forward driven team. Deeper in games with defenders tired, it’s much harder to slow down power players like Hertl, Kane and Meier. But even with substantial evidence for this approach, DeBoer insists on using the line bender. Is DeBoer’s constant blending a longer term investment? Is it his attempt to to figure how best to use his players if circumstances such as injuries, trades or suspensions occur? There is one more area which can give us a clue to the answer. It lies in the Sharks exploration of their AHL players (San Jose Barracuda). Some AHL players might be useful (or necessary) for the Sharks later in the season. Getting them familiar with the NHL team is an investment usually made early in the season. The return on this investment comes later in the season. Making the investment now is consistent with a coach exploring his long term options. The team has done nothing on this front. The Sharks have been among the league’s healthier teams, with only one key player (Joe Thornton) missing more than a game or three. The team could give playing time to potential replacements beyond their roster skaters, developing a bench to make the team deeper. The team hasn’t gone this path. The lone substitute player to garner meaningful playing time is forward Rourke Chartier (12 games), and he has been on the Sharks roster since the start of the season. Forward Dylan Gambrell played in one game (and is back with the Barracuda) while Tim Heed, the team’s seventh defenseman, has played once. The Sharks have done almost nothing to address the challenge which comes with multiple concurrent injuries. Something which happens to every team, every year. If the Sharks were serious about developing a deeper, more robust roster for this season, their AHL players would be involved. The evidence suggests DeBoer’s blender is used for short term purposes. His use of the defensive group doesn’t make long term sense. Nor has he pushed for San Jose’s AHL players to get some NHL exposure. Risks of constant blending include communication breakdowns and giving up high danger scoring chances. The Sharks are having these problems. Other teams in the division are dealing with integrating many new players, injuries and troubling starts (notably Anaheim, Vegas and Los Angeles). It is in the Sharks best interest to capitalize on their roster continuity and good health; pile up points now while concurrently keeping players fresh for the marathon season and hopefully lengthy post-season. The constant blending is undermining the benefits continuity brings. The Sharks coach has done plenty of blending among his forwards and defensemen in the season’s early going. Using this approach to get players get familiar with each other is a defensible decision. But the evidence suggests this is not DeBoer’s rationale for blending his players. Even if this is DeBoer’s reason, at some point, it makes sense to ‘set’ the roster and stick with the optimal line and defensive pairing combinations. This change should come very soon, many would argue it is already overdue. DeBoer is also overdue on trusting defenders like Dillon and especially Ryan; and to provide Heed and some of the AHL Barracuda players at least a whiff of NHL action. DeBoer loves his blender, so any expectation he’ll put it away is unrealistic. But it is time, or close to it, to use the blender a lot less. The critics of DeBoer’s approach are out there, but I’m not one of them. At least not yet. If DeBoer’s early season blending is a long-term building block (despite the evidence suggesting otherwise), I can support the coach. Still, if DeBoer continues this approach much longer, I’ll be joining the critics.